So, you're looking to get set-up with an extraordinary party bus excursion in beautiful Wichita? Well then, you've come to the right place! Wichita Party Buses is the area's number one provider of Party Bus and Limo Bus services. We work hard to provide outstanding customer service, reliable transportation, and beautiful vehicles. In all cases we are proud of the service we are able to give you, and also of the illustrious vehicle selection we can offer for you to chose from. At this point, it is appropriate to extend to you a sincere "Thank You" for giving us the chance and consideration in being your Party Bus company! We know that you want only the best for tour event and we're honored to be to be considered. You can expect Wichita Party Buses to be the very best option, as we have the most lavish vehicles, dedicated services, and the most affordable rates!. We always make sure we have the friendliest and most efficient reservation agents on staff to be there in all cases where you might have questions regarding our services. Our chauffeurs too, are hand picked to be the best and most accommodating group of drivers around. In all ends, our primary goal is to give you the finest experience we have the means to provide! If this means going above and beyond any reasonable expectation, that is what we will do. You can take confidence in our fastidious care in maintaining our fleet, and in our demanding standards with which we hold our staff to. All of this means that you are receiving the utmost BEST we can deliver in every stage of your process... from planning until drop off we require the very highest criterion! So, now that you know a little about who we are... We'd like to invite you to contact us! We are always available to answer even the smallest of questions. By always, we mean every hour of every single day, even holidays! By doing this we can insure that we are able to give you superb service even at the most unconventional time of day. We are gratified in knowing that we can always serve your needs. For our entire existence it has been our main goal to make sure our clients are completely satisfied with the services they've received from us. We strive to meet and exceed your expectations. We accomplish this by going above and beyond expectations, whether that is with our varied amenities or our extensive service area. 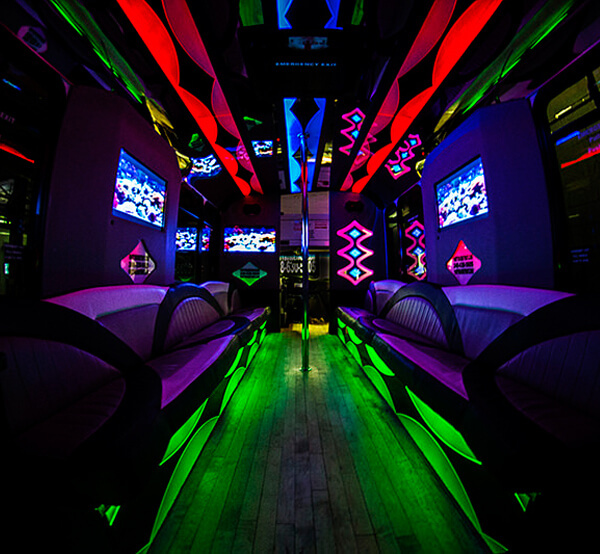 Our vehicle features include coolers, lighting, dance floors, and anything else you need to really party it up on a party bus! To sweeten the deal, we've extended our service range to cover a huge area so you can go pretty much wherever you want during your run! Our 24/7 services are available all over Kansas, as you can see by wiving our service area. No matter what event you rent for, you can count on us. We service all events!